I’ve always been fascinated by radios. I was a CB radio geek back in the day. 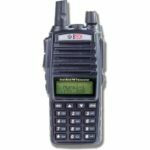 I’ve read about and tested most radios out there. There is something immensely satisfying in the ability to communicate without having to rely on the mobile grid. Even in this digital age. So today, I want to tell you a bit about MURS radios. More specifically – how to choose one and which ones you should avoid. Because there is a lot of misinformation being spread online about MURS radios. Crazy, right? I’m here to help you avoid that. MURS stands for Multi-Use Radio Service. MURS radios are good for short-range communications. Unlike ham (amateur) and GMRS radios, you don’t need a licence to transmit with a MURS radio. Of course, having a guaranteed way of communicating with others in the worst of times is also an essential prepper responsibility. MURS radios are a great way to keep up short-range communications when the cell-phone network goes down. With MURS you can call your neighbors for help, or keep up the communications while patrolling your area. MURS radios are simple to use. Just pick a channel and you’re set. Don’t need to program it or anything. A child could do it. There is a lot of misinformation being spread about MURS radios on the internet. Especially when it comes to buying advice. The cause of it all? Lazy research. Just because a certain radio can transmit on MURS frequencies… doesn’t mean that you’re allowed to do so without a license. Any radio transmitter that offers ham (amateur) radio frequencies needs an FCC license to operate. What this means is that you can’t use UHF/VHF radios on MURS frequencies without having a license. Side note: With a ham radio you can monitor MURS frequencies, but you cannot transmit. UHF/VHF radios are not a legal substitution for MURS Radios. Transmitting on MURS frequencies with UHF/VHF (ham, amateur) radio without a license is illegal. You can get fined for that. It’s confusing, because many of the ham radios on Amazon claim to be MURS compatible. While in fact, they can’t be operated without a license. Emergencies and SHTF situations are an obvious exception to this rule. When the grid collapses, ain’t nobody gonna chase you for not following the rules. 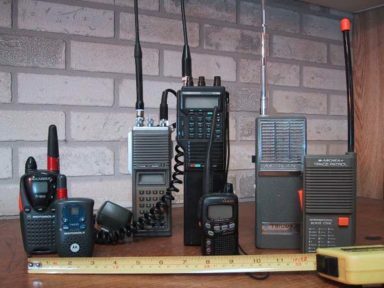 In a SHTF situation, ham radio will be your best bet – whether you have a license or not. Side note: Only Part95J certificated radios may be used to transmit on MURS frequencies. If your MURS radio is part 95J certified, it’s safe to use without holding a license. 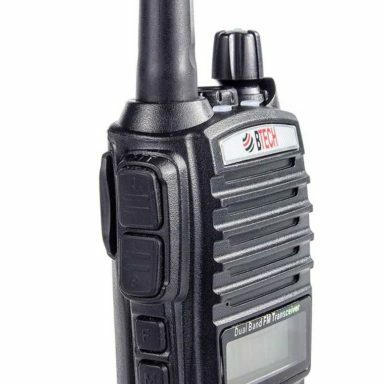 For example, the popular BaoFeng UV-5R is not type accepted for Part 95J and is illegal to use for transmitting on MURS frequencies. Within the U.S. you can only use these 5 frequencies that are allowed by the FCC. Using frequencies outside of what’s allowed can result in a heavy fine. There are groups monitoring this, and it’s possible to triangulate your location based on your signal. A proper MURS radio without modifications will not be able to broadcast on any other channels anyway. The third thing you need to know is the range of MURS radios. 2-3 miles of range is the maximum that you should expect under ideal conditions. Ideal means having a clear line of sight. That doesn’t give us too much to play around with. Remember that factory listed distances require ideal laboratory conditions and a clear line of sight. Buildings, walls, trees, floors, and hills will reduce the distance that the radios can cover. The last thing you need to know is that MURS is an open frequency. This means that anyone with a radio can listen to anything you say. In other words, MURS frequencies are not safe for transmitting sensitive information. A simple way to solve this problem is to come up with a code system of your own. Give a code name to every person and place that you mention on the radio. That’ll make it harder for others to understand what you’re talking about (and to track your movements). On to the buying guide. As I explained above, using a normal ham radio without a license (even on MURS frequencies) can get you fined by the FCC. Believe me, you don’t want that to happen. 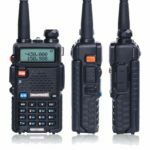 So, here is a list of the best Part 95 certified MURS radios on the market today. 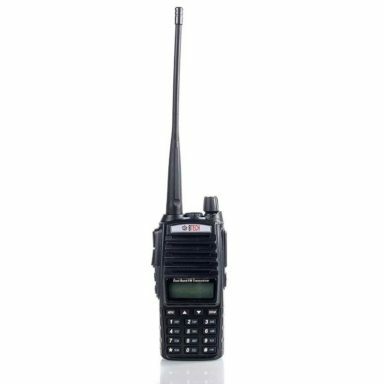 I’ve personally verified that all of the radios included in this list are legal to use without a license U.S.A.
BTECH MURS-V1 is the best MURS radio for sale today. It has more features than any other MURS radio on the market. (In fact, this thing retails at a whopping 1/4 the price of Motorola below). None of the other MURS radios on the market have these three. BTECH-V1 blows the competition out of the water. You can use this radio on your normal 5 MURS channel frequencies. It’s Part-95 certified and legal to use without a license. The radio comes with a full set of privacy tones: 50 CTCSS and 346 DCS. These codes are used to filter out other people on MURS channels. They won’t prevent others from listening to you. There are three modes: On, Off, and Standby. Standby mode is a must for extending battery life. There are also two power modes – 500mW and 2W. Put the radio on 500mW when you don’t need the range to save battery. You can even lock the keyboard by holding the # key. So that you don’t change the selected channel accidentally. There are indicators for battery level and signal strength on the LCD screen. According to my estimations, the 1800ma battery lasts for about 10 hours (90% standby, 10% usage). It takes about 3.5 hours to charge the battery from zero to full. You should know that BTECH-V1 is made in China by Baofeng. That’s how they keep the costs low. The good news is that Baofeng has an excellent reputation. They’re well known in the radio community and make quality products. That’s also true for this radio. The build quality is good. Strong plastic – feels like a workhorse radio. Signal range is about 1/4 mile in the woods and 3-5 miles on flat terrain from my experience. Normal MURS radio range, you won’t find anything better than this out there. One neat thing that I liked is that you can listen to 2 channels simultaneously. And then choose based on where the signal is coming from. 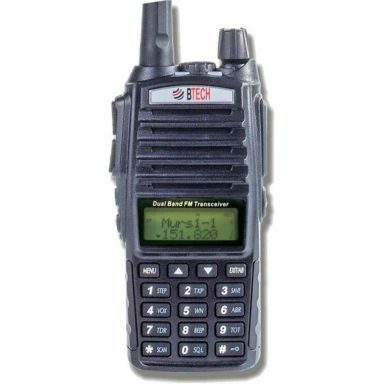 BTECH-V1 has everything you need from a MURS radio and more. This is hands-down the best MURS radio on the market. What more could you ask for? I mean, the only reason why you wouldn’t want to buy this radio is because… it’s made in China. If that’s the case, be my guest and check out the U.S. models that I’ve included below. I promise that you’ll come back to the trusty BTECH in no time. Click here to check price on Amazon. 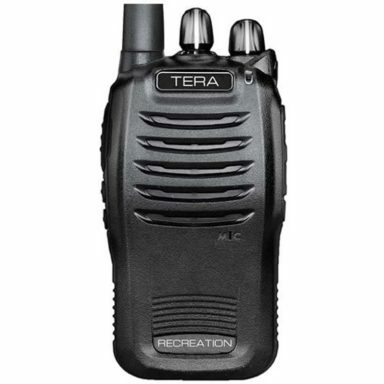 Tera TR-505 is the only radio that I know of that is certified for both MURS and GMRS. This radio has both 95E and 95J certifications. You’re getting 5 MURS channels, 16 GMRS Channels. 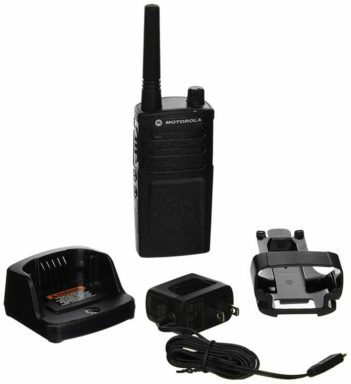 It’s great for SHTF/emergency use, as it can receive both GMRS/MURS frequencies. But as I’ve said before, you need a license for transmitting on GMRS frequencies – transmitting without a license can result in a fine. 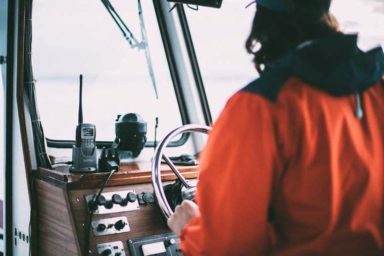 Personal experience – locally, there is quite a bit of activity on the GMRS channels, so the likelyhood of hearing information on GMRS is higher in during a SHTF/TOTWAWKI. Now, when it comes to features there’s not much to talk about. 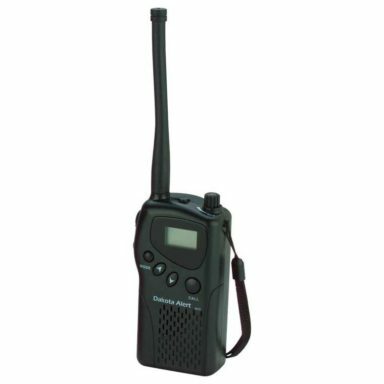 Especially when comparing this radio to the BTECH-V1 above. First off – It’s expensive. 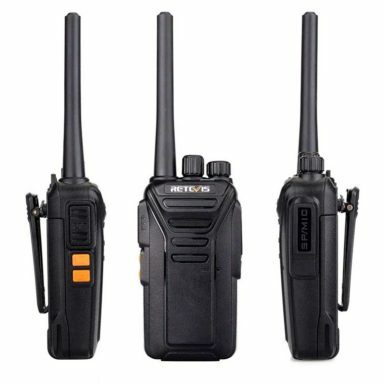 You can get a little less than 3 BTECH radios for the price. The battery will last about 10 hours with normal daily usage. Charging takes around 3 hours from zero to full. There are 3 modes: on, off, and standby. There are two modes for high-low battery usage. You get a battery level indicator – even though the radio doesn’t have an LCD. The radio comes with a 1-year warranty and is factory supported and serviced in the USA. Tera TR-505 is for you if you want a radio that is programmable for both MURS and GMRS channels. If that’s not the case – you’re better off going for the BTECH-V1 that I reviewed above. TR-505 doesn’t have enough features to justify its high price. Motorola RMM2050 used to be “the” MURS radio for a long time. It’s a good basic radio with a proven track record, but… it’s expensive as hell. You can get 4 BTECH-V1’s for the price of ONE Motorola. I mean, you can see from the price alone that this radio was made for companies with huge expense accounts. Motorola is charging in the ballpark of $200 for a simple MURS radio… and they’re getting away with it! And what does all that money get you? In other words – nothing much. Just your basic MURS functionality with some additional features packed in. Of course it’s nice that the radio is Mil-Spec. Means that it’s rugged – you can throw it around a bit. But for that price, they could have made it waterproof at least. Voice channel callout is an interesting feature. You can leave the radio on the belt and check what channel you’re on… without using your hands. Nice to have? Yes. Need to have? No. It doesn’t offer anything special except for the Motorola brand name. If you’re fine throwing more than $300 on a pair of MURS radios and you need that Motorola name on your radio – go for it. Otherwise, this radio is just a waste of money and I recommend you go for the BTECH V1. Retevis RT27 is a Chinese-made set of MURS radios. You’re getting 5 radios for less the price of one Motorola. At this price point, of course they’re mass-produced in China. You get your basic MURS functionality – 5 channels and license-free use. But you can see that they cut costs on quality. Battery life is reduced – only 1100mAh. I wouldn’t count on getting more than 5 hours out of these walkies under normal use. The battery is rechargeable via USB. I couldn’t find any reports about the reliability of these radios. My educated guess is that you get what you pay for. Quantity, yes. Quality? Who knows. I wouldn’t rely on the Retevis radios for anything serious. They’re cheap, but you get what you pay for. I’d recommend you to get yourself 2 BTECH-V1’s for what these ones cost. At least you’d have something you can rely on. Dakota Alert used to be the cheaper MURS alternative to Motorola before BTECH-V1 came along. Now it’s just an overpriced radio that doesn’t offer much for the money. It seems that the battery life is higher than with other radios. I haven’t been able to confirm this, though. Dakota alert is a small family-run business near Sioux City. Made in the USA is always good to have. Expecting competitive quality from this radio would be too much. This radio was developed as a part of a Dakota’s driveway alarm kit. While they sell it as a stand-alone MURS radio, it doesn’t really compare to the cheaper BTECH-V1. Unless you want the driveway alarm that comes with this, you’re better off looking elsewhere. This is the only definitive guide on MURS radios on the internet that I know of. Don’t believe other sites that list ham radios as part of their “best MURS radios” guides. You don’t want to risk that fine. I gave my best here and included everything that you should know before buying a MURS radio. Please let me know in the comments if you think that anything should be added to this guide. I’ll be keeping this one up to date. Thank you! This is exactly the article and informal i was searching for!!! I am the Security Director for a church that has four campus locations. 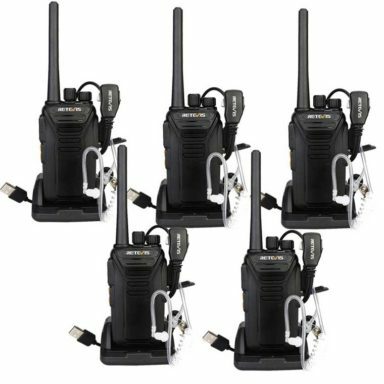 I have the responsibility of selecting new radios for our different locations. We currently use Baofeng 888 radios that were purchased several years ago by someone else before I came along. Their transmission and reception quality are not what we expected, and the batteries are wearing out. I’m interested in the MURS radios because they don’t require the FCC license, are simple to use, and our campus locations are relatively small. However, we would be using them both inside and out, and my concern is their ability to transmit through walls with clarity. We have staff both inside and outside during events. What are your recommendations for MURS radios that will reliably transmit with clarity both inside and out? MURS radio power is limited by regulations – since they can be used without a license, there is a limit to how powerful they can be. Which is why all models are manufactured at “maximum” allowed specifications, and have the same range. While I haven’t tried the Baofeng 888 personally, I’ve only had good experiences with the brand and others I’ve met are also fans of the brand. Anyways, hope I could help!